Here are four reasons you need this book. 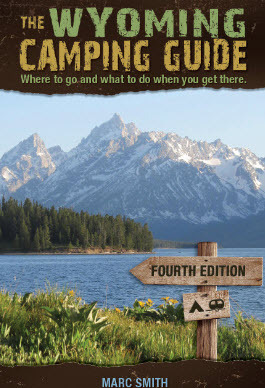 The 404-page Wyoming Camping Guide contains the most detailed and up-to-date information available for the hundreds of public campgrounds in Wyoming. Aside from National Park Service, Forest Service, BLM, and state-managed sites, the book also points out where you'll find dispersed campsites and the towns that have privately-owned campgrounds. We've done the research for you so you can plan less and do more. Each campground was thoroughly researched and personally visited numerous times over nearly two decades. It’s loaded with dozens of pictures, and with an 8-page color insert, there is no guessing about what the areas look like. You'll also find detailed maps that make navigation easy; there are regional overview maps, local area camping maps, and detailed maps for state parks and other high-density areas. It’s packed with outdoor recreational opportunities. The Wyoming Camping Guide goes far beyond campground write-ups. You'll find descriptions for nearby trails, picnic areas, scenic drives, 4x4 routes, wildlife viewing areas, rivers, lakes, and natural attractions. You’ll even find where to go fishing, boating, and rock climbing.